Our man at Headingley Stephan Shemilt's report of day one is here. Look out for the Test Match Special podcast, which will be available here soon. And the scorecard is here. Join us tomorrow for day two at Headingley from 10:30 BST. See you then. England do lose a lot of wickets late in the day. They don't see it through to stumps. But if they bat the whole day tomorrow, they win the Test match. Do not let Pakistan in by letting them win that first session. Captain Joe Root looked in fine touch too, carving some wristy flicks to the boundary. 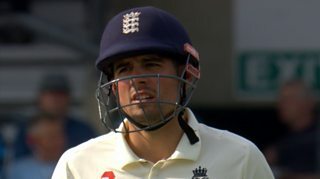 Cook and Root took England to 100 for the loss of just one wicket. But Cook couldn't quite hang on until the close, miscuing a pull shot and gloving a short ball from Hasan behind. England closed on 106-2, trailing by 68 runs. Graham Thorpe has been around this week. I love Graham Thorpe, because of what he brings. He's got that steel and I don't think he would be scared of saying a few things to one or two players if he thought they weren't pulling their weight. 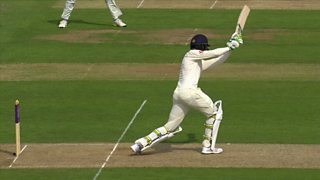 The visual of Keaton Jennings today just looked right. Despite a fine display with the ball, England's batting have plenty of questions to answer. 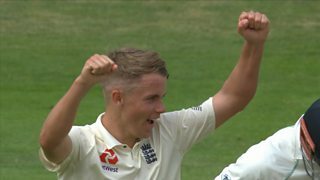 ...before he holed out to give England debutant Sam Curran his maiden Test wicket. 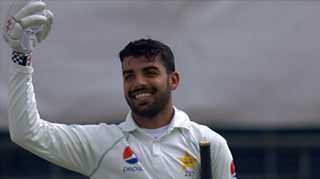 Pakistan were all out for 174 and play broke for tea. 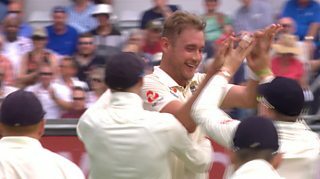 Stuart Broad on the work he's done on his bowling action: "It's a small thing - I've looked to place my index finger right on the seam and lock my wrist in a bit more. "My thumb is a bit more in control on the seam. I did a bit of research, talking to bowlers about how they do about things. Locking my wrist gives me the confidence to flick my wrist, and my shoulder alignment is key." Broad's fellow opening bowler James Anderson struggled to find the right line and length in his opening spell. 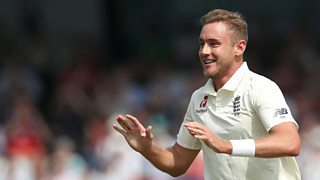 But he returned after the lunch break in vicious fashion, nipping out Sarfraz Ahmed and Faheem Ashraf in quick succession, while Broad picked up his third wicket in between. Pakistan were reeling at 79-7. I hope England realise we saw something different in them today. We want to see that on a regular basis. Last week, England looked like an amateur team, with some of the field settings and positions. Today, they had a slip cordon that looked solid. 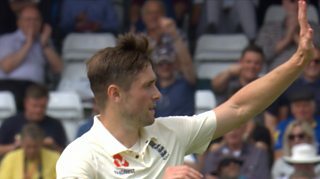 Everything about the operation out in the middle - yes, when you're getting wickets, it's easier - but that is the DNA of what England in the Test arena should be. 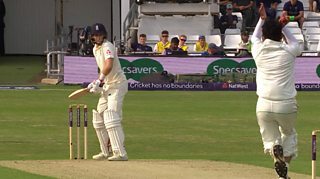 England bowler Stuart Broad, who took 3-38, speaking to Sky Sports: "I don't think any of us expected it to nip or swing like it did. We're delighted with the pressure we built, we let a few boundaries slip by if we're being critical on ourselves but to get that many wickets in that time was brilliant. "I understand the criticism of me from the first Test, I like listening to pundits speak. A lot of it is justified, some of it is not. I didn't feel some of the flack that was coming my way was overly logical. "There was an angle of promoting own shows and own columns in that criticism but that's the way of the world. I know within myself I'm bowling well and creating chances and that wickets will come when it's my day." Pakistan won the toss and elected to bat first on what looked like a good batting deck. There was some cloud cover and it was humid early on though and a fired up Stuart Broad bowled a full length and found some dangerous swing. And Broad soon had another, removing Azhar Ali for just two. Chris Woakes got in the action with two wickets of his own as Pakistan fell to 68-4 at lunch. Fantastic. This was a different England. I think it was a good toss to lose and it did more than we all expected. It felt like perfect batting conditions. 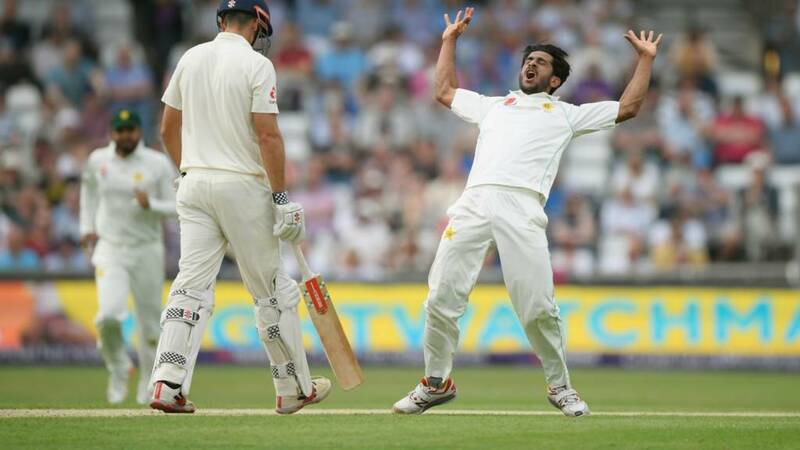 England bowled better – they pitched the ball in the right areas and brought the batsmen forward. You could see in the warm-ups and in Joe Root's interview yesterday - it was different to what they showed at Lord's. From this position, they have to win the Test match. My question is, why does it take so much prodding for them to turn up? Almost the ideal day for England, save for that dismissal of Alastair Cook late on. The hosts look rejuvenated compared to their struggles at Lord's. Those smiles sum up a good day for England. They've done everything right. Pakistan have fought back well but it's not quite landed for them. They didn't get the swing with the ball that they were looking for. Joe Root is giving Dom Bess a prolonged hug as they walk off. 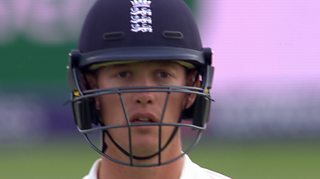 Joe Root takes a single off the first to leave Dom Bess five balls to negotiate. And the nightwatchman does well, repelling everything that Hasan throws at him. 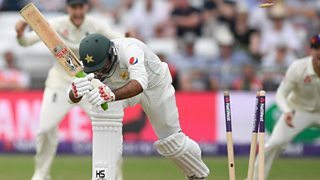 Sarfraz Ahmed brings in three men round the bat for the final ball of the day - it's a bouncer and Bess calmly ducks under it. England get through to the close on 106-2, trailing Pakistan by 68 runs. Replays show that was indeed sliding down leg. Bess defends the last. Joe Root is happy to take the single and trust Dom Bess on strike. 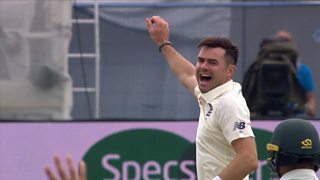 Shadab sends down a wrong 'un into Bess' pad and there's a big appeal from around the bat. Nothing doing from the umpire though. I was really impressed with Dom Bess in the first Test. If he gets stuck in tonight and hangs around, he can really settle in tomorrow.